This timely volume provides an in-depth look at why the field of communication is so central in initiatives for social impact around the world. In Distinctive Qualities in Communication Research, editors Donal Carbaugh and Patrice M. Buzzanell bring together scholars with varied and productive approaches to communication to address the question of what distinguishes communication research from similar studies in other disciplines. Each contributor responds to the question: "What makes your research communication research? How does your program of inquiry treat communication not simply as data, but as its primary theoretical concern?" Their responses are the heart of this book. The questions addressed and answered herein define the qualities that set research in communication apart from work in related fields, such as social psychology, linguistics, sociology, anthropology, and psychology. The book begins and ends by looking across these studies generally, bringing into view not only the specific possibilities in the study of communication today, but also what such study contributes generally to understanding human problems, social relations, and communities. This volume provides an invaluable resource for graduate students beginning their study in communication; academics needing to define the distinctive contributions that communication research makes; and administrators who want to understand the scope and breadth of work in communication. 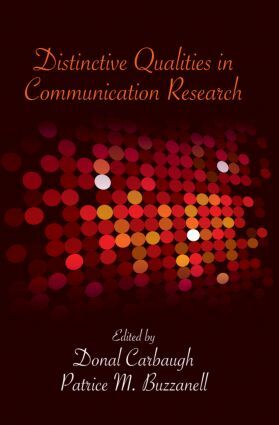 It provides an invaluable resource for defining the role of communication research in the academic community and the contributions it makes to the study of human interaction. WHAT IS DISTINCTIVE IN COMMUNICATION RESEARCH?